Hawaiian Group or Sandwich Islands. New Zealand. Viti Group or Feejee Islands. Society Islands. Marquesas or Washington Is. Galapagos Islands. Samoan or Navigators Is. A beautiful 1855 first edition example of Colton's map of Hawaii, New Zealand, and several Polynesian island groups. The sheet contains seven separate maps. The top map, occupying the upper half of the sheet, details the Hawaiian Islands or Sandwich Islands, as they were also known. This particular mapping of Hawaii dates to the 1841 U.S. exploring expedition to the Pacific. A second inset map inset in the lower left corner of the Hawaii map details the Samoan Islands. While Colton most likely grouped these together as a matter of space saving practicality, we find it ironic that both territories would eventually fall under United States sovereignty. 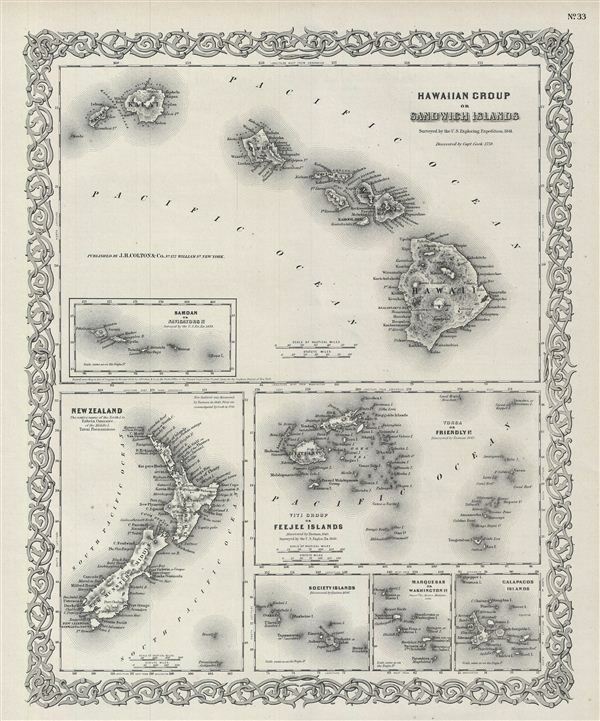 The lower half of this sheet features a large map of New Zealand, and smaller maps of Fiji (Feejee), Tonga (Friendly Islands), the Society Islands (Tahiti), the Marquesas (of Typee fame), and the Galapagos Islands (made famous by Darwin's discoveries). This map also identifies various cities, towns, rivers, mountains, and an assortment of additional topographical details. Surrounded by Colton's typical spiral motif border. One of the few Colton maps to be issued without color. Dated and copyrighted to J. H. Colton, 1855. Published from Colton's 172 William Street Office in New York City. Issued as page no. 33 in volume 2 of Colton's 1856 Atlas of the World. Rumsey 0149.100 (1856 edition). Phillips (Atlases) 816.